So... How do you feel about eating "old" beef? Yeah, dry aging means you're eating old beef! 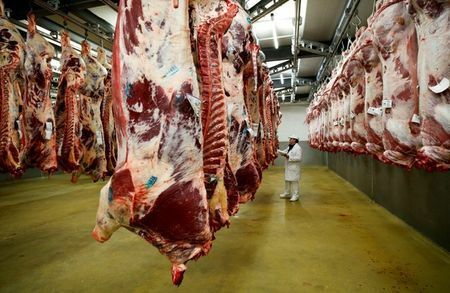 After the animal is slaughter and before the beef is cut into individual cuts, the carcass is hung (like shown below) so natural enzymes in the meat have a chance to eat away some of the muscle tissue. Like a good cheese maker, butchers watch the beef and give it time to "mature." Most of the time, butchers only dry age the primal cuts (which are the high end steaks) but we dry age the whole carcass because we believe that your family deserves more than just high quality steaks, but high quality roasts and ground beef, too! Ideally, dry aging takes place in a climate controlled room where the humidity and temperature is carefully watched to make sure the conditions are perfect for the natural enzymes! Dry aging is a lucrative process, but truly makes all the difference in the taste of your beef! We make sure to take the extra steps to give your family the best beef possible. Questions? Comments? Leave me your thoughts down below! Buzz Word Dictionary- What does all the grocery store slang mean?